When Dr. Danielle Kassow was growing up, every now and then she’d grumble, “I’m bored!” Few things irritated her mother more. Not much has changed since Kassow was a child. Parents still loathe hearing the “B” word, and kids still pull it out of their complaint repertoire. Even in an iPod, Xbox, DVD world, “boredom” persists in the tot-through-teen lexicon. “If a very young child says she’s bored, she often means, ‘I don’t like what I’m doing right now,’” says Leslie Meisner, program manager for early learning in the Tacoma School District. Then it’s the parent’s job to come up with ideas. “Devise a list of conversation starters,” Meisner says. “Ask your preschooler, ‘What’s your favorite book? If you could buy anything at the grocery store, what would it be?’” Give her little projects, such as counting how many apples are in the fridge or how many chairs are in the house. Let’s say your child is doing a report on bees. The topic’s interesting, and your child is enthusiastic about the project. But where — and how — does he begin? That’s often because they’ve had too much screen time, she contends. “Watching TV and playing video games are highly entertaining but passive activities.” You don’t need attention skills for them, says MacKenzie, and they won’t help your children learn to sidestep boredom. MacKenzie likes to help young children learn strategies to avoid boredom and stay busy. “I ask them, ‘What can you do to help yourself wait?’” She suggests activities kids can do by themselves, such as coloring and playing with Legos. She tells parents to set a timer for different amounts of time to get children used to playing alone. Set the timer for a bit longer than your children can normally work by themselves and help them plan their study agenda, she says. When the timer goes off, check on them, gradually increasing the time they spend alone. 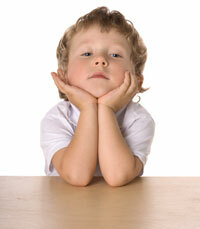 Ask your child what he means when he says that he is bored. Is the work too challenging — or is it too easy? Talk to your child’s teacher. Are there other projects the teacher can give the child? Is he or she understanding the assignments? Try to find out if your child is not paying attention or focusing and if so, help him or her work on those skills. Consider the possibility that your child is not bored and that he or she is rather making a bid for more attention from you. Turn off the electronics and get kids involved in old-fashioned play. Originally published in the May, 2008 print edition of ParentMap.